while i was pregnant - as most women do - i followed along with the growth charts that tell you what size fruit your growing baby is each week. each week my mom and i got a kick out of the fruits, waiting for the baby to grow from something small like a grape to something more tangible, like a melon. one particular week - i don't remember which, exactly - he was the size of a blueberry. since then, my mother in law affectionately referred to my growing bump as "blueberry." for whatever reason, that was the fruit that stuck in her mind. 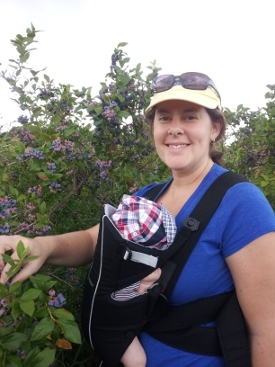 so it's fitting that last week - when blueberry was five weeks old - my mom, the baby, and i went blueberry picking for the very first time. we picked and picked and picked. 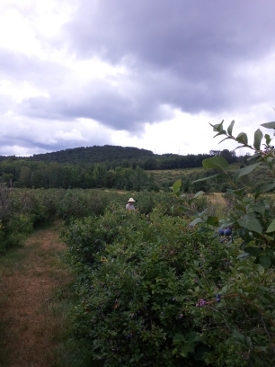 and in one hour, went home with more than twelve pounds of berries. while i froze two thirds of them, needless to say, this is the first of a few blueberry treats i've made since. in your food processor, combine the blueberries, yogurt, and sugar and blend until smooth. strain the mixture using a fine mesh strainer to remove the blueberry seeds. mix in the vodka and lemon juice and chill for at least one hour or over night. process in your ice cream maker and transfer to a container to freeze completely. check out more sweet treats at sweet tooth friday and sweets for a saturday! Ahh, the "your baby is the size of a [insert random, exotic fruit here]!" We did those, too ... my peanut is about three weeks older than your little blueberry, and though we don't have blueberry picking around here, I can't wait to take him peach picking next year, and apple picking this fall. So much fun to share with your kiddo! Oh blueberry! How precious! I've got frozen berries. Great idea! Your recipe sounds really great and easy, but why vodka? What is a good sub. that's N//A? My 3 adult children, aka Oops, Uh-uhh and Oh-No, have been the very best surprise gifts one could ever wish for. Now I have 3 gorgeous and healthy grandchildren. The gifts just keep giving !!! Hi bev, the vodka helps keep the yogurt soft, so it's scoopable, instead of rock hard. If you prefer not to have alcohol, omit it, and let the frozen yogurt sit out for 5 to 10 minutes before scooping so it can soften slightly. Kate, thanks I'll try it.